Whew! Thirty days, thirty poems and I did it! For the third year in a row, actually. And it was fun! And now we come back to "normal" on the blog. As usual, NaPoWriMo is making me want to write more poetry, which last year I did, so I think this coming year you might see even more poems. But who can say what I will write before I write it? Not me. That is my intention with this blog. To write spontaneously each day, a sense-memory of where I am in the world. Today I have something a little different, though, because last month I bought an awesome new blender and I am excited enough about it to share it with you. Not to make money (I've dropped my amazon affiliate and actually, I think you're probably better off buying it at Costco, if you can). I want to share this discovery just because I am always amazed at how very little things can make a system work. And I am a huge fan of making systems work. Having the right tool (for you) matters. Lots of my friends have Vitamixes, but I don't. And I was starting to get jealous, because I love green smoothies and spring is the perfect time to be drinking one of them for breakfast every morning. But honestly, I cannot afford a Vitamix. I had a choice, I suppose, and I chose a new camera. And I think in the scheme of things, I'll always choose a camera or travel over a pricey kitchen item. That's just who I am. Travel and photography are my big ticket items of note. Just like my husband's big ticket items are musical instruments and travel. And Remy's are toys and travel. Hmmm... travel is a big theme in our family, dontcha think? Anyway, like I do, I researched and researched. And I found a blender that is almost as good. And in one way, it is in fact better. And that is that there is a small bowl in addition to the large one that came with the system. Even though it doesn't make greens entirely smooth (there are still teeny tiny little pieces of roughage), this blender is so far beyond my last (cheap) blender that I am in foodie heaven. Getting the blender also coincided with my finding out I have high cholesterol, which means we needed to make some dietary changes. We've switched from rice night (yes, it was a real thing, Monday, Wednesday and Friday we ate a rice based dish at home) to quinoa night. And it turns out, I am really good at making quinoa salads. 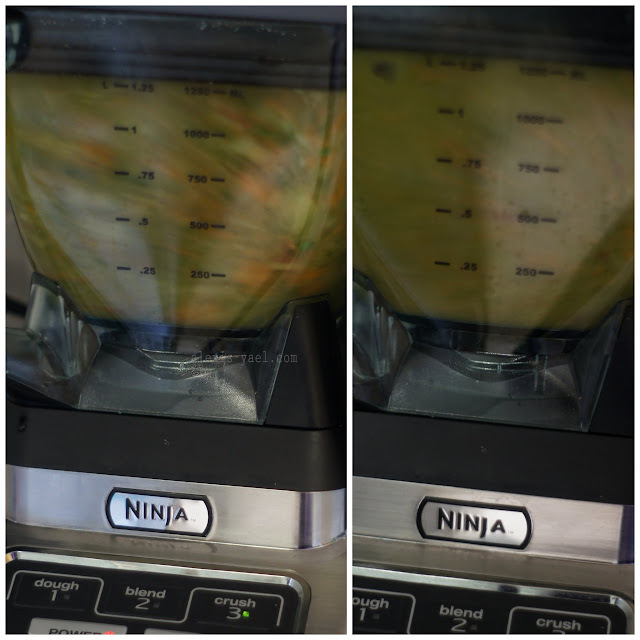 4-6 cloves of garlic, a finger of ginger (peel the garlic and ginger, but you can leave them whole), a little olive oil, a little sesame oil, and enough water that your blender will whip it completely smooth (in a Ninja that's more water than a Vitamix or Blendtech, but much less than a normal blender). This makes an AWESOME sauce to sauté greens or vegetables in. And if you have a little extra liquid at the end of cooking, you can add a little corn or potato starch and make it into a gravy. This is completely amazing on top of quinoa. Mmmm... garlic ginger greens. 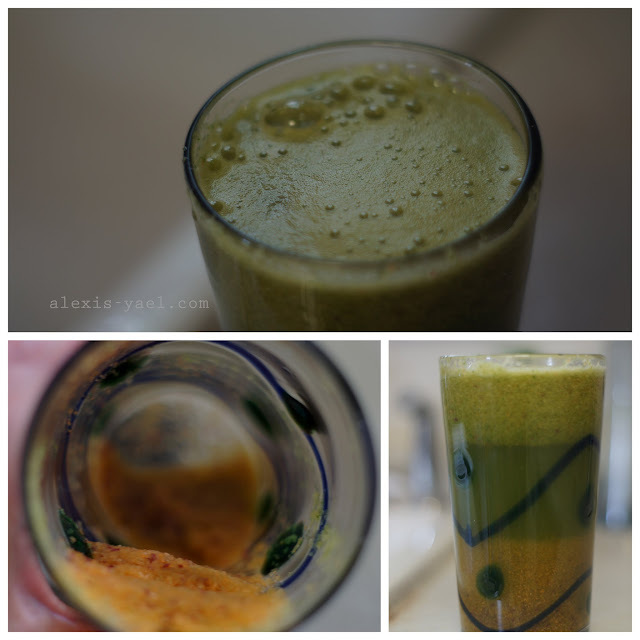 These first 4 photos are of an apple, carrot, spinach juice I made the other day. Instead of straining it out, I left the pulp in the juice and I think most of the carrot pulp ended up in the bottom. I probably should have stirred it again, to make it more of a smoothie, but I enjoyed it and that's what matters! The last 2 photos are of an - also amazing tasting - experimental smoothie I made last month with frozen mixed berries, kale, frozen edamame, a whole key lime, avocado and ginger. Something in it (either the edamame or the lime) did not sit well with me so I haven't used either of those two ingredients in smoothies since. Just FYI.